Big data is expanding, and by next year almost a majority of businesses will be attracted towards the brighter prospect of this cutting edge technology. Even this year saw an enormous increase in volume, variety, velocity of data, which assures that the next year will witness more data, more numbers. To substitute human intelligence, cognitive technology is emerging out of ashes. This superior feature will automate the human-induced activities, including face and writing recognition. It will also address the intellectual issues, like human-like conceptualizing, reasoning and understanding. In short, thanks to this technology, now the situations requiring human intelligence assistance can be resolved with the help of automation. To gather information from numerous sources of data, including the biggest Big Data source Hadoop, Data virtualization is the need of the hour. With this, you can make use of the distributed data storage in real-time, and 2018 is going to witness some massive changes in this regard. Functional predictive models improve business performance by analyzing big data to accentuate its true potentials. It works by discovering, evaluating, optimizing and deploying meaningful data, which eventually depletes the risk and enhances future profitability. IoT is becoming the air we breathe. It is so fast evolving, that in no time it will be all around us, and yes by 2018 businesses and users are about to see some enormous changes in this field. More and more people are relying on their smartphones and tablets to do daily chores, including important personal and corporate transactions. Blue chip companies are investing largely on the IoT to execute the exchange of information seamlessly. And why shouldn’t they, the biggest advantage of this sensor-based analytics is that businesses of all sorts will be able to enjoy the benefits and put to their best use! Data science is incomplete without machine learning. It helps the analysts in managing increasing complexities in the data world. The best thing about machine learning is that it easily analyzes huge piles of information and processes intricate data at a lightning fast speed with accuracy, of course. With a comprehensive array of improvised hardware, large amounts of data and hi-tech algorithm, machine learning makes progress towards achieving better results. After the Ransomware attack this year, companies have become lot more cautious in regards to keeping their business operations safe and secured. AI will take into account all sorts of security breaches, making it impossible for the spammers to break configured security codes. Besides, it is that unique tool that comprehends the unlabeled data in the most accurate way without any possible need of human intervention. Coupled with some other auxiliary technologies, AI will prove to be the most powerful tool for data protection and safeguarding confidential company information. 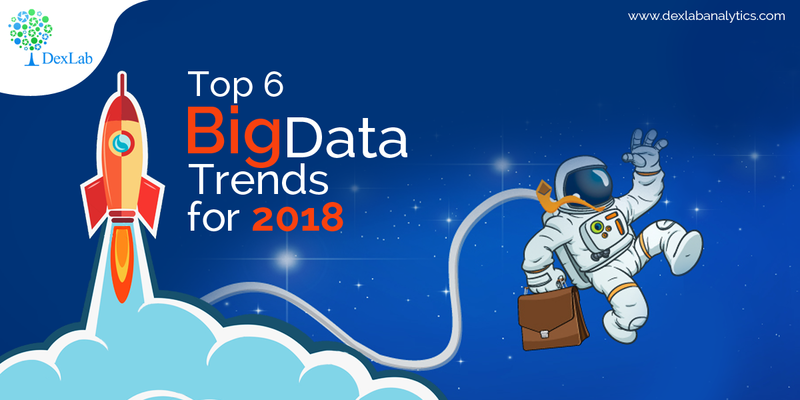 The abovementioned predictions are going to make Big Data the most sough-after trends of 2018. Right from cognitive technology to data security, big data coupled with its enhanced version will make sure it clears all the backlogs, while giving you the most advanced form of technology, safe and secured. For more information on Hadoop certification in Gurgaon, look up to DexLab Analytics – it is a one-stop-learning-destination for Big Data Hadoop.